Ava seems to be coming along learning to be of help with the cows. She’s still somewhat fearful of them, but at the same time so excited about her job that she just trembles all over. Last week when they got mixed together she helped run the bull back to his pen by running up behind him and grabbing him by the tail. He bolted right back to where he was supposed to be! She’s quick. She knows to retreat when a cow swings around toward her and charges. She’s catching on to the herding. 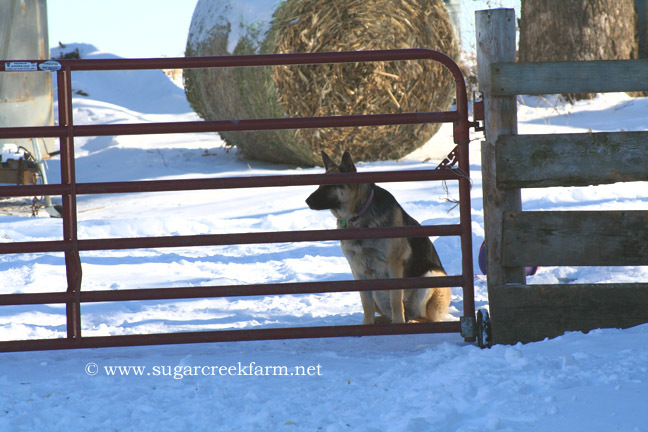 Next up is to teach her to guard an open gate. very cool, i’m excited to see her progress. we plan to get a great pyranees puppy in two months. they were just born. we hope to train her to help around the farmette. night time chicken duty, a little cow management and general scary dog behavior toward strangers. She’s going to be a regular herd dog before long. Any calves yet? Your directions for cooking soup bones were awesome by the way (although my husband thought I was a LITTLE strange for running from the kitchen to the computer to check the directions a couple of times). It was INCREDIBLY yummy, and now we won’t be tossing those soup bones. karl – just be sure to keep that Pyr contained. Otherwise they think they have to patrol a 2 or 3-mile radius. Some of our neighbor’s did not appreciate this “free service” :)qs – thanks for letting me know that the recipe worked out for you! Hooray!